Brighten Teeth, Freshen Breath & Rock Your Day with bamboo toothbrush 100% Natural Bamboo Toothbrush! Every year, more and more plastic toothbrushes end up in landfills which has disastrous effects on the environment! These effects range from pollution in the air to increase in global warming and are overall hazardous for our health. We made our set Natural Bamboo Toothbrush to provide you and your family with an Effective, Eco-Friendly, and Healthier alternative to traditional toothbrushes that cleans and brightens even more! HOW LONG DOES A BAMBOO TOOTHBRUSH LAST? Just because we're natural doesn't mean we don't last as long as plastic brushes. In fact, we last just as long as a standard toothbrush before needing replacement (roughly 3 months). The Bamboo Toothbrush is the right step to go green and reduce your carbon footprint while getting the same great results you would with a traditional plastic brush that you're used to using! Our BPA-Free bristles also protect the health of you and your children by not leeching unwanted hormone disruptors into your body. Our Bamboo Toothbrush with Soft Bristles use BPA Free Nylon that's recyclable as well as light on the gums while providing maximum performance to remove stain, tartar and plaque for white teeth and healthier gums! This durable and biodegradable toothbrush pack features Perfectly Crafted and Smooth Bamboo Handles that are completely biodegradable, long lasting and less porous than ordinary wood! With an ergonomic grip, sleek and timeless design along with unmatched quality, this is a must-have oral accessory for every bathroom. ❤ A PACK OF 8 TOOTHBRUSHES - will last one person a full year. Buy a pack of 8 toothbrushes for each person in your household. ❤ GUARANTEED - Just send it back our way for a full refund of the purchase price. It's natural quality with an unbeatable guarantee. 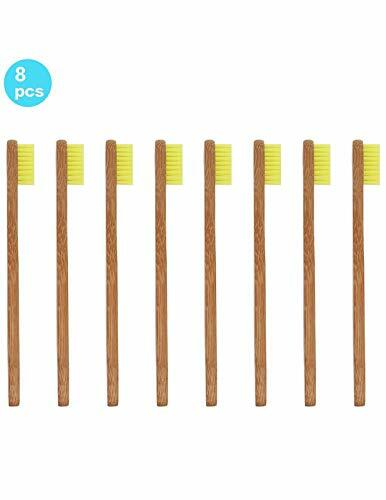 ❤THE BEST BAMBOO TOOTHBRUSH SET - Pack comes with 8 Eco-Friendly Toothbrushes with smooth handles and soft BPA-Free nylon bristles. ❤SOFT & UNIQUE WAVY BRISTLES FOR BETTER CLEAN - The wavy design hugs tooth surfaces and gums to help remove plaque and bacteria from your teeth. If you have any questions about this product by SoniFox, contact us by completing and submitting the form below. If you are looking for a specif part number, please include it with your message.